I think I’m going to have to put this book on my wish list. Joe Pennel, in addition to being the father of some people I knew from Lambuth, was a well-respected bishop, and a collection of his “Ponderings” is probably a worthy read. You can read a review online at The Tennessean. So far, I’ve posted religious music on Saturdays. Today however, the song that’s stuck in my head is an old one, but it’s really fabulous. The video is just a still image, but the song, The Girl from Ipanema, is classic. To view it, go to the youtube link. Also, this week marks the 42nd anniversary of the day that changed rock music. From the time of childhood to the death of Opryland, I’ve always lived within easy driving distance of an amusement park. Now someone wants to build one near my in-laws in Rutherford County, TN. The theme of this park will be the Bible. Maybe I’m overreacting (now that I think about it, that should probably be the title of this blog, because it’s usually the case) but this is a horrible idea. Why do we, as Christians, feel the need to have a Christian equivalent to every secular form of entertainment? When will someone start a Christian casino? We have Christian books, Christian music, Christian greeting cards, Christian t-shirts, Christian ring tones, and the list goes on and on. Is Six Flags over St. Louis somehow anti-Christian? Does all of our entertainment have to be Christian based? Is everything that’s not explicitly Christian then anti-Christian? I should add that the planners are saying that it will not offer Biblical interpretation, it will an entertainment park with a Bible theme. (Christian Post article) At the same time, people in the area are promoting its possibilities. But this park may help some peoples souls. This park could be the one thing that changes peoples hearts back to loving God the way we need to. If we save once [sic] young soul we have profited more than all the gold. It’s possible that someone could learn more about Christ through one of these theme parks. But if this amount of work and money was spent on things specifically intended to nurture God’s kingdom, how many more would learn? From there Elisha went up to Bethel. As he was walking along the road, some youths came out of the town and jeered at him. “Go on up, you baldhead!” they said. “Go on up, you baldhead!” He turned around, looked at them and called down a curse on them in the name of the LORD. Then two bears came out of the woods and mauled forty-two of the youths. Sounds like a good ride for the kids. Aside from the basics of food, clothing, shelter, insurance and orthodonture, the thing I probably spend the most money on is books. So I’m always interested to see what “great books” people have in their lists. There are a lot of books that I’ve read in this top 100, and many that I’ve never even heard of. It’s a subjective list of course, but it’s fun skimming through what others like. …half the books on these lists make Biblical references that must be known by the reader for them to understand the message of that book. If a Western man desires to understand the culture that surrounds him, he needs to have a thorough understanding of the Book that has shaped that culture. That photo is from a light display at the Washington National Cathedral that took place this weekend. You can look at other photos on the flickr stream: Cathedral though I have no doubt that photos cannot possibly do justice to seeing the illumination in person. 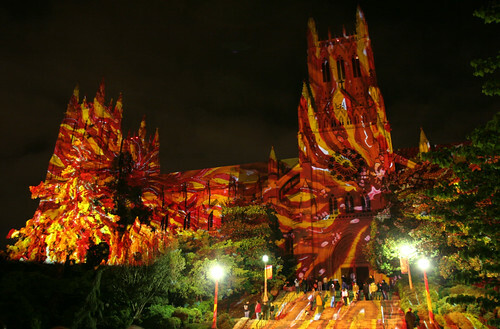 For three memorable nights in May, Swiss lighting artist Gerry Hofstetter brings his artistry to Washington National Cathedral for a spectacular exterior illumination of the south and west sides, in celebration of the Cathedral’s centennial. Numerous vivid images will be projected directly on the Cathedral sunset to midnight on Friday, Saturday, and Sunday, illustrating its mission of reconciliation, spotlighting its role as a spiritual beacon for the nation, and proclaiming hope for all humankind. I’ve been to very few Christian concerts, but through the Ekklesia Project, I was fortunate to hear The Psaltersat a gathering two years ago. Now my son, who is only 9, has some of their music on his MP3 player. It’s rock and roll for the desert fathers. It borders on cacophany, mania, and pure spirit. Their music calls to mind the scripture of 2 Samuel, in which David dances before the Lord with all his might. Praise the Lord. This Sunday is Pentecost – the day we mark the presence of the Holy Spirit in the life of the church. It is also Mother’s Day. In America, Mother’s Day began in a church. Within a decade, the woman who helped to start it was bemoaning its over-commercialization. If you want to go out to eat Sunday, fine, I’m all for it. I’ve gone, and I’ll probably go again (I think I’m grilling this Sunday though.) You won’t be alone. It’s the most popular day of the year to eat out. Buy Mom a gift. I’ll be buying my mother one, and we traditionally send my grandmother’s to church with corsages. Flowers and plants are our favorite gifts. My wife already bought hers. The average amount to spend is somewhere around $125-$140 — roughly 15.8 billion dollars will be spent to honor Mom. The commercialization of Mother’s Day bothers me, but it’s not a major concern. What bothers me is that Mother’s Day will be part of the worship service in a large way. The choir at church will be singing a song which is in reference to Mother’s Day. We’ll probably do the “Who’s got the most kids here?” “Who’s the oldest mom?, Who’s the youngest?” sort of thing. What’s the harm? There’s no harm whatsoever in acknowledging that it’s Mother’s Day. I wouldn’t even mind if we gave a few extra moments during the greeting and said “make sure you greet mothers”. But Mother’s Day is not a church holiday. It shouldn’t be. Think of the other Holy Days. Pentecost, Advent, Christmas, Lent, Easter, throw in All Saints’ if you want, Ascension, Trinity, whatever. Who are those days about? They, including All Saints’, are about God’s relationship with us. We honor God when we honor those Holy Days. All Saints’ may be the most tenuous, but it is certainly a remembrance of how God has worked through those members of the church who have gone before us (including mothers). Yes, we can be thankful for our mothers, but Mother’s Day will not be celebrated outside the US this Sunday, other countries have other days for doing this. It’s simply not a Holy Day of the church. It is precisely the point of the liturgy to take people out of their worlds and usher them into a strange, new world—to show them that, despite appearances, the last thing in the world they need is more of the world out of which they’ve come. The world the liturgy reveals does not seem relevant at first glance, but it turns out that the world it reveals is more real than the one we inhabit day by day. I know I’m overly cranky about this. I know I’m borrowing trouble before I even go to worship, that I will be challenged to be worshipful and reverent instead of grumpy and scowling. But that doesn’t mean that the liturgy isn’t important, that we shouldn’t be aware of the tension between how the world shapes us and how we’re called to be shaped by God in the church. Happy Mother’s Day, Blessed Pentecost. The Secrecy of Bishops, DSs and the SPRC. Somewhere deep in the catacombs of West Tennessee in November of each year, the SPRC meets under candlelight. Once the sacrifices are made, they cast lots to determine whether the leader of the church will stay or go. They gaze into the reflections in a pool to discern what other pastors may be available. Then they mind meld and let the Bishop and his cabinet know what will take place in the upcoming new year. Spring comes and the Bishop and the cabinet dance around the Maypole, wreaths of flowers in their hair. They fall in exhaustion and sleep visionary dreams. When they wake, in complete silence they determine the paths of those in their conference through examining tea leaves, watching the stars and playing Ouija. Or not. Usually the SPRC gets the general consensus of the church, discusses the needs of the church, and makes the best decision they can. This, despite the fact that in the case of a recently appointed pastor, they may only know the person they’re discussing for a total of a 5 months. The Bishop and the cabinet take those things into consideration, look at who’s retiring, who’s available, which big churches will get to pick someone outside the conference, and then fill in the gaps as best they can. I know that everyone, from the members of the SPRC to the Bishop, is a less than perfect human, a Christian doing what they can to discern God’s will while trying to make the people happy. So why does this become such an ordeal every time it’s obvious that some sort of change is needed in a local church? Why does it have to be cloak and dagger secret society sort of work? Can the local church not handle it? I think they can. We have got to do something to make the appointment system work better. From what I can tell of the votes at General Conference, that something is study the topic for another four years. Frankly I don’t think that’s good enough. Can we, on the conference level, say that here you’ll get three years when you go to a new church before you have to worry about such thing? I know, that means technically you have three years if the new pastor doesn’t work out, but how can you even know that it’s going to work out without one cycle through the lectionary? Can we say that at least we won’t make a decision during the first November that a pastor has been at a church? Would pastors be a bit more patient and observant when they arrive at a new church if they knew that they had time to get to know these people before they were going to have to look at moving again? Of course, I have more questions than answers. I’ve not served on SPRC, and I doubt that my gifts would benefit that committee. I’m not a pastor. I don’t know what that’s like either. But as a church leader, I know that the current system, which doesn’t allow the majority of the church to know much of what is going on until weeks before a new pastor arrives, does not work. We need to be more open; open in discussing the problems we may have with pastors, open to how the SPRC and Bishop’s cabinet make their decisions, and most importantly, open to how the Holy Spirit may lead guide and direct us in the work of God. Author gmw3550Posted on May 6, 2008 Categories Uncategorized1 Comment on The Secrecy of Bishops, DSs and the SPRC. What I didn’t know is that it’s likely that when the choir sang this, Mullins was dead. You can read more about him on his Wikipedia entry. He died in a car wreck at the age of 41. He intentionally lived a life of economic poverty. He was an inspiration to Caedmon’s Call. He was a fine player of the hammered dulcimer. I know very little about contemporary Christian music. I find a lot of it to be spiritual candy, tasty but not very nourishing. It appears that Mullins was nourished and through him, the spirit can provide fulfillment. The video below is of another of his songs, based on the Apostle’s Creed. It is worth watching all the way to the end.